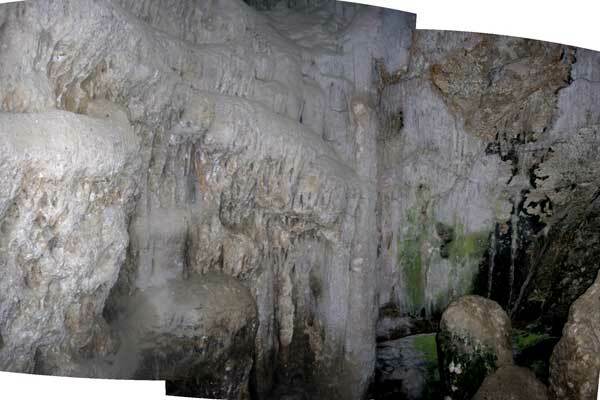 The Davelis Cave is located in and above an ancient marble quarry, where much of the marble for the Parthenon on the Acropolis of Athens was excavated. It's exact location is not widely known (except to some climbers who scale the surrounding cliff) & it is infrequently visited as the rough track leading to the cave is unmarked. 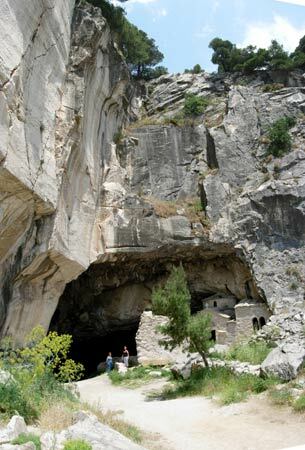 The cave was known as a shrine since antiquity & was a used by worshipers of the Greek god Pan. Artificial and natural niches and pedestals on the walls once held statues and offerings. A hollow in the wall bears a small water pool. 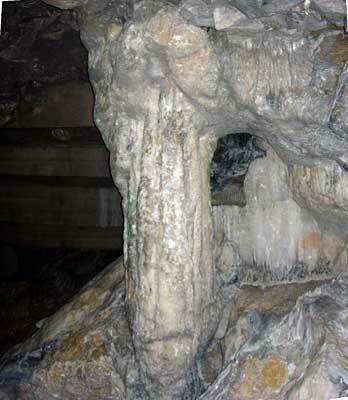 There was another Pan shrine in a much smaller cave (2nd century AD Nymph shrine or Nymphaion) a few hundred meters higher up on the mountain. 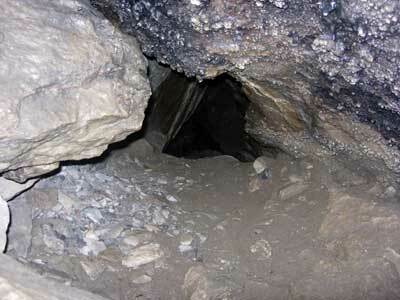 This small cave has been greatly destroyed by the quarrying operations during the recent decades. Artifacts from this Pan shrine are held & once exhibited at Athens Archeological Museum. Later during the Christian-Byzantine era it was inhabited by hermits & later by monks & holy men. 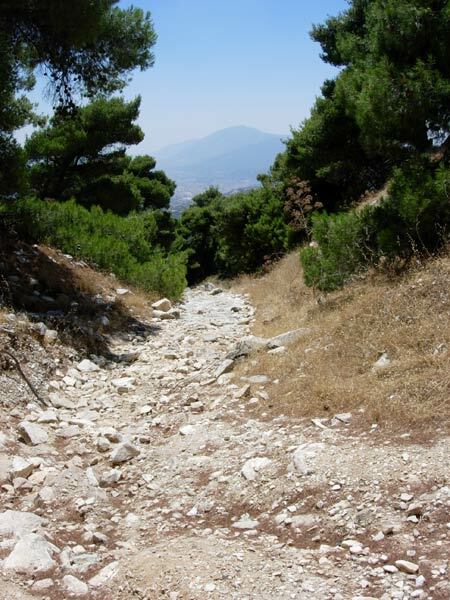 Around the 8th century AD, Mount Pendeli, riddled with more than sixty known caves and hollows, acquired the name 'Mountain of Amomon (the Sinless Ones), as many Orthodox monks retreated to the mountains to avoid persecution and preserve their Byzantine tradition and some took refuge there. Carvings of angels on the rock walls of the Cave of Amomon, or Davelis, at a height of approximately 700 metres on the south-west face of the mountain above an ancient quarry, have been provisionally dated to this period on the basis of their style. 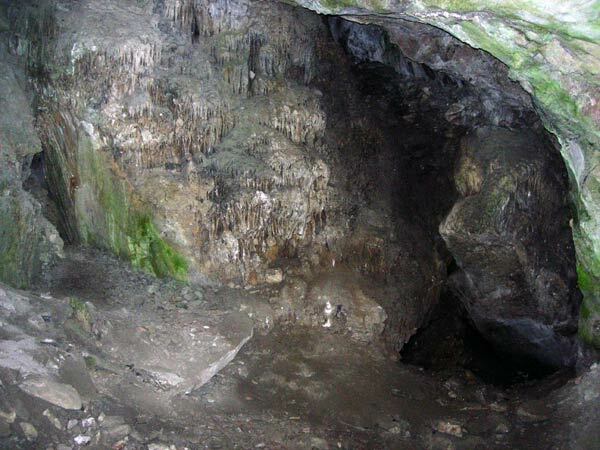 Legends tell that in the mid-19th century Davelis, a famous robber and outlaw, used the cave as one of his many hideouts around Attica. Davelis had a kind of Robin Hood status, and was popular with various romantic society ladies. Legend also says that Davelis had an ongoing affair with the Duchess of Plakentia, a French noblewoman who lived in a mansion (the Villa Rododaphne?) further down the mountainside, near Old Pendeli village. 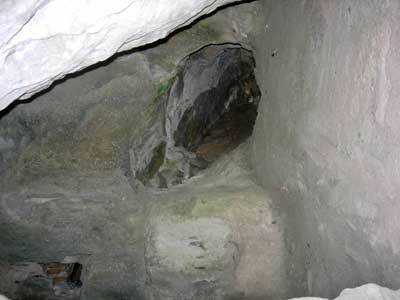 Legend also says that there was a system of tunnels connecting the cave with Duchess's palace and also the nearby Pentelikon Monastery. (A few years ago about 200 metres of this tunnel was shown on Greek TV by television journalists - to a point after which the tunnel had collapsed, blocking any further exploration). 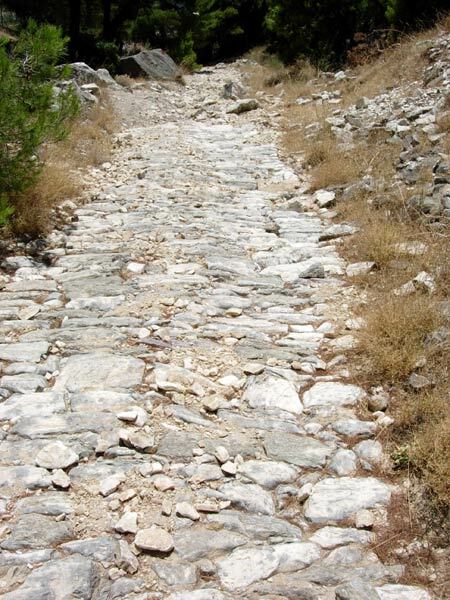 Davelis career ended when he was pursued and killed near Mount Parnassos, and his head taken to Athens and displayed on a pike in Syntagma Square. 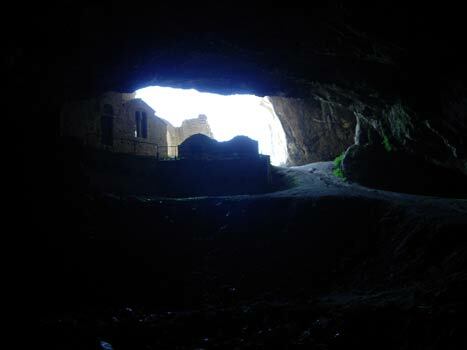 Apparently, the seventeenth century Turkish traveller, Evlia Tselepi, claimed that he was shown extensive underground galleries by a monk of Pendeli, and it is probable that their entrance was gained via Daveli's Cave. 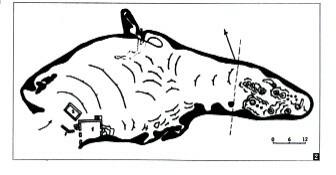 Plan view of the cave (Approximately 70 m long, 45 m wide, 20 m high). Note the elevated section to the right of the dotted vertical line (which extends the length at least 25 m). 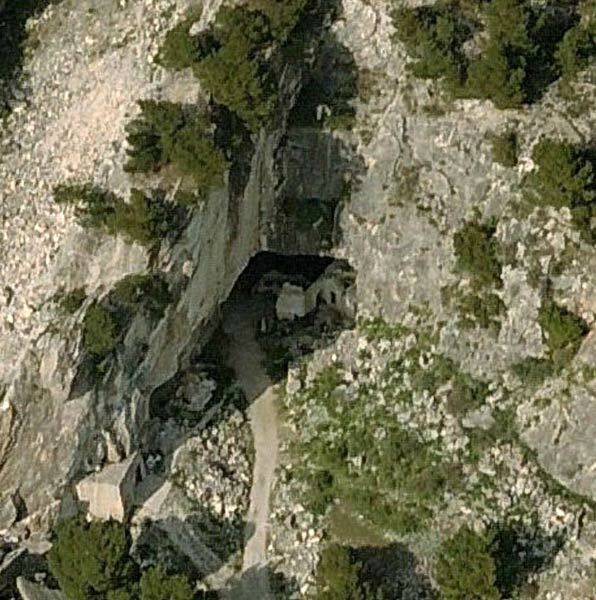 Note the concrete structure built by the Greek military to the left of the cave entrance - secured by a steel door. The sheer rock face is sometimes scaled by rock climbers. 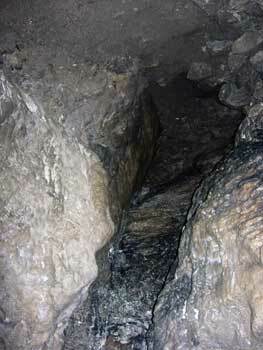 The entrance to the Davelis Cave at the foot of the large cliff. The chapels can just be seen. 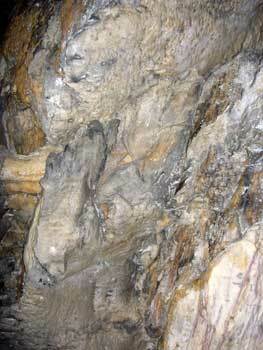 Cascade of Stalactites near the entrance to the cave. View from high in the back of the cave - the sunlight shining through the entrance to the cave can be clearly seen. 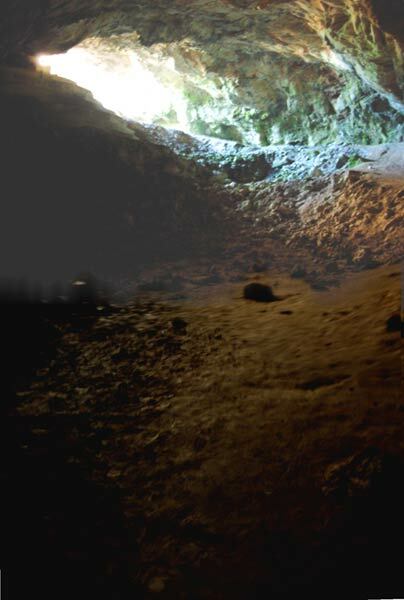 Same view from the back of the cave as the sunlight fades and the cave becomes dark inside. Sounds of water dripping from the roof and strange cracking sounds can be heard. Very spooky!